I received this Bible as a complimentary copy for writing this review from "Booklook Bloggers" or Thomas Nelson Publishers. The opinions here in are mine alone, although I did get some input from a young lady of 10 years old who I asked to tell me her thoughts as well. I personally like it because it is the NKJV of which I am partial to. I also like the extra features it has in it, such as Key Verses, Interesting Small Facts, Life in Bible Times, People in Bible Times and Live It. 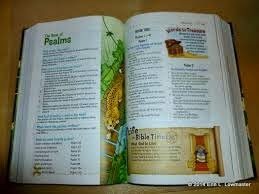 Each of these features will help the child to understand the Bible better as well as explain more things in detail. 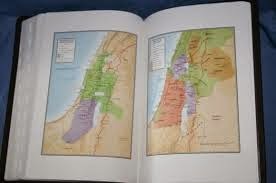 In addition to these, it also contains Book Introductions which tell the basic facts about the books of the Bible such as who wrote it, where it took place, and why it was written, as well as giving them a list of favorite Bible stories and teachings in that specific Bible book. I like this because it will continually keep the child interested in reading and moving on to see what comes next. This Bible also has a Subject Index in the back of the Bible, which will help them find different subjects and people covered in this Bible. Which would be great for doing reports for school. 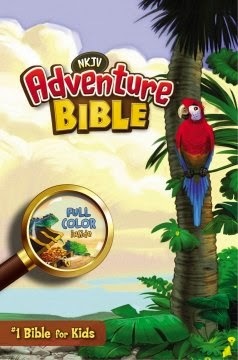 The Concordance is a helpful verse finder and the Bible has many full color tip-end pages which offer activities set to a jungle safari theme which are very colorful. There are also maps as well. This is a beautiful book. At first, Kirah had a bit of trouble reading it, as a lot of 9 and 10 year old youngsters would, but the more she got into it the better she liked it and the easier it became. I would recommend this Bible for any child, but unless they are avid readers it may be a bit difficult for them at first as well. This would be the PERFECT Bible for a parent and child to sit and read together. This way the child would get the benefit of learning to read the Bible and it would set them on the path to making Bible reading part of their daily routine. It would also be a “bonding time for the parent and child”. This is SO IMPORTANT. The Bible tells us to “train up a child in the way he should go and when he is old, he will not depart from it”. This is part of the training. This is a wonderful book that I think ALL children would enjoy. Have a wonderful day, and May God Bless!